Send out blank masks with the party details attached. Tell guests on the invitation to decorate the masks with feathers, glitter and paint and wear the masks when they arrive at the party. Give them the option of buying or making their own mask. And tell them there will be a contest to see which guest is not recognized for the longest time during the party. Give out prizes for the best or most elaborate masquerade masks. Buy or make pretty invitations from pretty scrapbook paper that has a mask pattern. If guests come to the Masquerade birthday party with their masks take pictures as they enter and then have a guessing game to see who can guess the identity of the most party guests. Before the birthday party select several pictures of celebrities from magazines. Make small masquerade style masks for them from scrapbook or construction paper and glue to their faces. Give guests paper and pencils and ask them how many of the celebrities they can identify. This can also be played as an icebreaker game when guests are arriving. 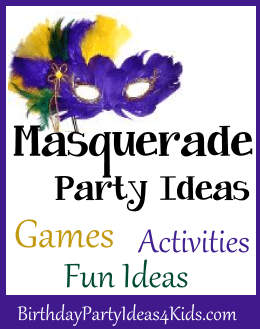 Our Mardi Gras page has fun party games that complement the Masquerade party ideas! 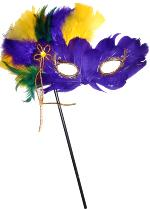 Decorate the Masquerade party with vivid colors highlighted with black or silver. Decorate with gold candles, candelabras and serving trays. Hang strings of white lights around the ceiling and walls and intertwined around the decorations on the tables. Place small topiary's on the tables and decorate with small colorful masks. Hang mask cut outs from the ceiling with fishing line or curling ribbon. Set up a table with plain masks and let the party guests decorate their own mask. Give them choices of different colors of sequins, rhinestones, feathers and lace. Serve a mystery dinner where guests don't know what they have ordered until it is brought to them. A really fun game and dinner ideas all in one. See our mystery dinner page for menu and directions. Create a designated dancing area for the kids and decorate it with a disco ball, strings of lights and/or lots of blown up balloons that are placed on the floor for party guests to dance through. Let the kids freestyle dance or teach them some new dances (look on YouTube for dancing videos) like line dancing or some old fashioned ball room dancing.